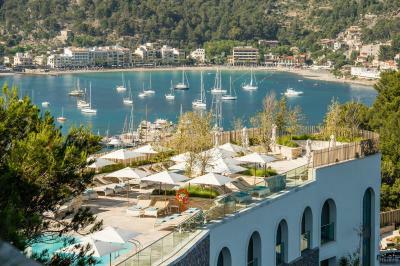 Lock in a great price for Jumeirah Port Soller Hotel & Spa – rated 9.4 by recent guests! I really liked the location and views on top of the Mountains. A beautiful hotel with everything you could need. The infinity pool was super nice and very helpful staff the whole time. Excellent stay, wonderful staff and an amazing view. Will be back soon! 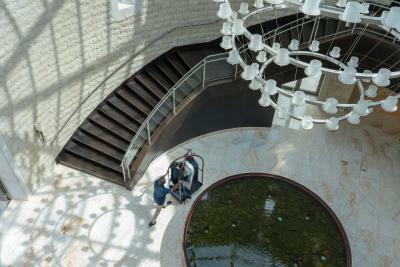 Amazing luxury hotel - exceptional staff, and exceptional service - second to none! 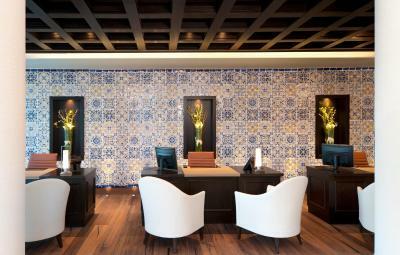 Go and enjoy the luxury and pampering. Sensational spa. We'll be back! extremely luxurious with comfy beds and amazing views. The staff went out of their way to make our stay special for my husbands 40th birthday. We had an upgrade, glass of cava with dinner and a birthday cake left in our room for him. Nothing was too much trouble and the hotel is gorgeous. Food was excellent in both cap roig for lunch and the Asian tapas and cocktails in sunset sushi lounge were so tasty-not to mention the amazing views and sunset. 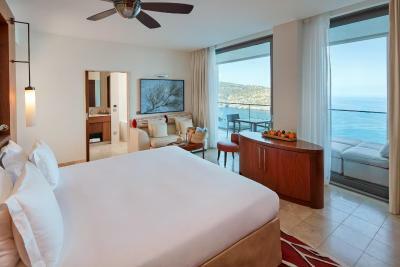 Jumeirah Port Soller Hotel & Spa This rating is a reflection of how the property compares to the industry standard when it comes to price, facilities and services available. It's based on a self-evaluation by the property. Use this rating to help choose your stay! 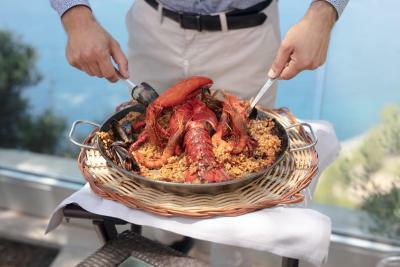 One of our top picks in Port de Soller – and a guest favorite. 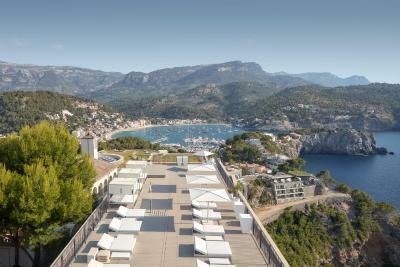 Located on Mallorca’s north-west coast, this modern hotel overlooks the Port de Sóller Bay. 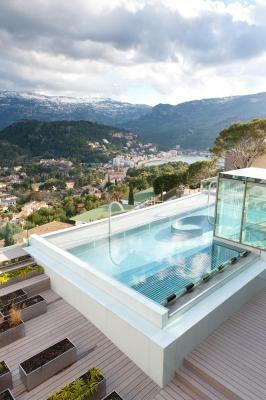 It offers an impressive infinity pool, a fitness center and a spa, all with fantastic views. 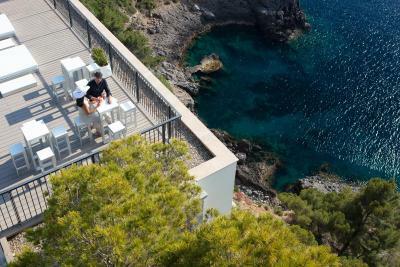 The stylish, air-conditioned rooms at Jumeirah Port Soller Hotel & Spa feature a private balcony, free WiFi and a flat-screen satellite TV. Each one has a coffee maker and a mini-bar. 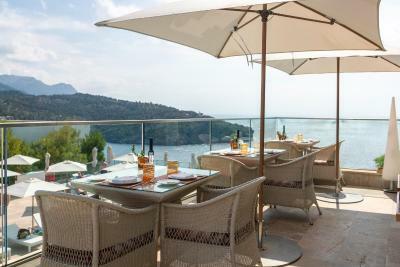 Jumeirah Port Soller Hotel & Spa has 3 restaurants which serve a wide range of dishes and offer fantastic sea views. Cap Roig offers traditional Mediterranean food and Es Fanals serves a creative selection of Spanish tapas and Sunset Sushi Lounge is popular for its selection of freshly prepared sushi, Asian-style tapas and locally inspired cocktails.There are also 2 pool-side bars. 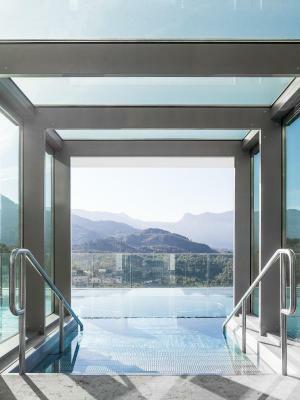 Talise Spa at Jumeirah Port Soller features a hammam suite, a heated hydropool and a thermal area. 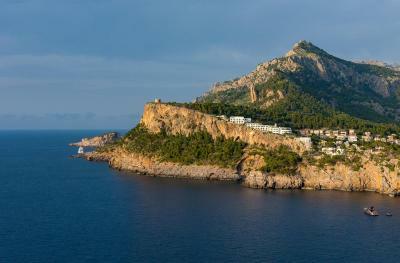 The town of Valldemossa is a 25-minute drive from the hotel. Central Palma and Palma Airport are each 35 minutes’ drive away. 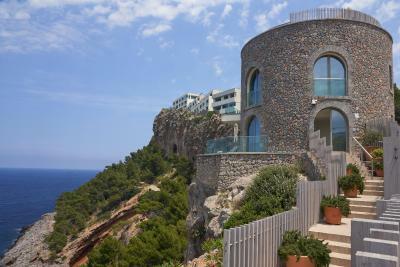 When would you like to stay at Jumeirah Port Soller Hotel & Spa? This stylish, air-conditioned room features a private balcony with mountain views, free WiFi, a flat-screen satellite TV and an iPod docking station. There is a sofa bed, coffee maker and mini-bar, and the private bathroom includes a hairdryer. 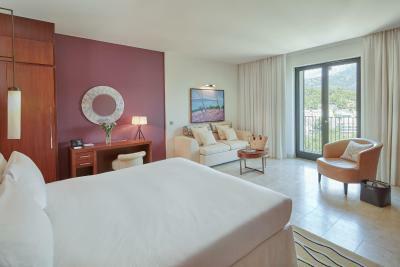 This spacious, air-conditioned room features a private terrace with views of the Tramuntana Mountains. 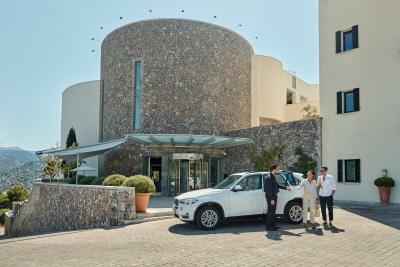 It comes equipped with free Wi-Fi, flat-screen satellite TV and an iPod docking station. There is a sitting area with a sofa bed, coffee maker and minibar. The private bathroom includes a hairdryer and bath. 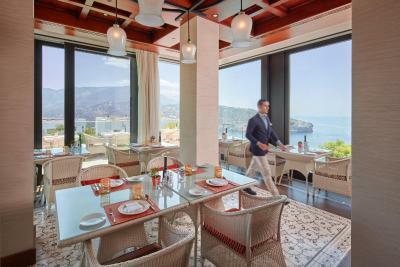 This spacious, air-conditioned room features a private terrace with sea views. It comes with free WiFi, flat-screen satellite TV and an iPod docking station. There is 1 double bed, a seating area with a sofa bed, a coffee maker and a mini-bar. The private bathroom includes a hairdryer and a bath or shower. 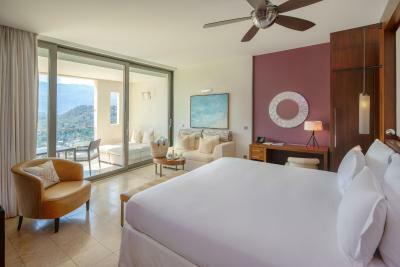 This air-conditioned suite features a private balcony with views of the Tramuntana Mountains. It comes with free WiFi, a flat-screen satellite TV and an iPod docking station. There is 1 double bed, a seating area with a sofa bed, a coffee maker and mini-bar. The private bathroom includes a hairdryer, and some suites come with a spa bath. 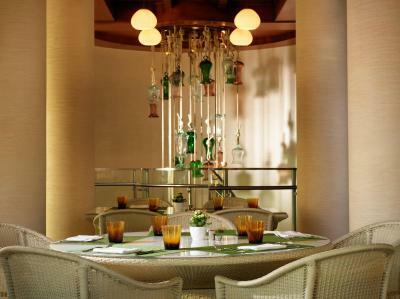 These spacious suites have a terrace or balcony with sea view. 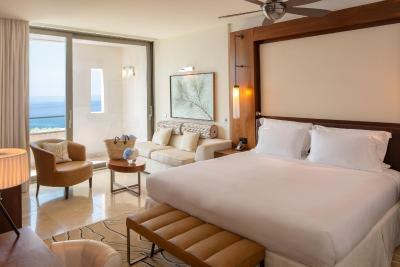 Suites boast a lounge area with sofa bed, satellite flat-screen TV and air conditioning. A coffee machine and mini-bar are also available. 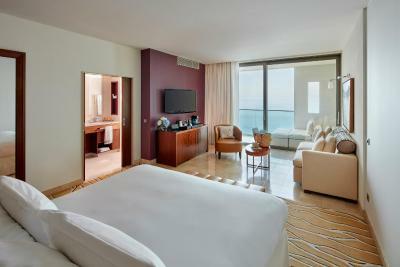 Featuring an elegant décor, this air-conditioned room has a balcony with sea views. It includes a lounge area with a sofa bed and a satellite flat-screen TV. A coffee machine and a mini-bar are also available. 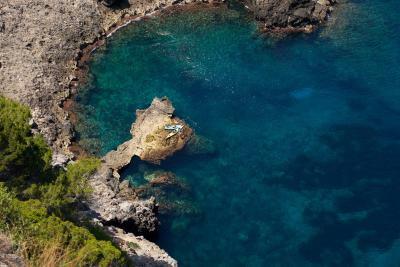 This elegant two-bedroom suite is perched on a rock surrounded by pines an ancient olive trees. It features sea views and large windows. This double room has a electric kettle, tile/marble floor and satellite TV. 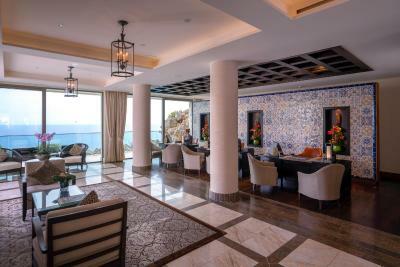 House Rules Jumeirah Port Soller Hotel & Spa takes special requests – add in the next step! 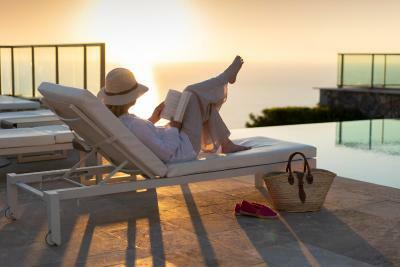 Jumeirah Port Soller Hotel &amp; Spa accepts these cards and reserves the right to temporarily hold an amount prior to arrival. Jumeirah Port Soller Hotel & Spa accepts these cards and reserves the right to temporarily hold an amount prior to arrival. Please note that breakfast is only included when consumed in the restaurant. Some more internal activities offering would be welcomed, e.g. snooker, piano bar, etc. Really can't fault it. We had 'worst' room (overlooking carpark) but it was still fabulous! Everything was 5 Star, staff, breakfast, rooms, facilities, location and views over the port. Port Soller is beautiful. Amazing restaurants in the port. I arrived and opened the closet to have the bottom part fall at my feet. Also one of the sink was clogged. So I wasn’t expecting any of this for a 5 Star Hotel. Details is very important when you have clients paying for the quality. The lay out of the hotel is long and thin, as you pass through parts of the hotel to get to other facilities you end up in dark rooms. Also the smell from the drains, made us eat inside; not pleasant eating outside at all - we actually moved tables.